The Federal government is losing billions a year on outdated alcohol taxes yet Big Alcohol is pushing the so-called “Craft Beer Modernization and Tax Reform Act of 2017” to lower taxes even further. If signed into law at least $321 million dollars in excise tax revenue will be lost. It will be at least a $177 million dollar gift to the distilled spirits industry, $126 million to brewers, and $18 million to winemakers. Federal alcohol excise taxes have not been adjusted since 1991, which means the US Treasury is losing over $7 billion a year due to inflation alone. Meanwhile, economic harm from excessive alcohol consumption costs $249 billion annually, including 88,000 deaths, alcohol-related car crashes, violence, chronic illness, and lost productivity. It’s time for Big Alcohol to start PAYING their fair share, NOT LESS! 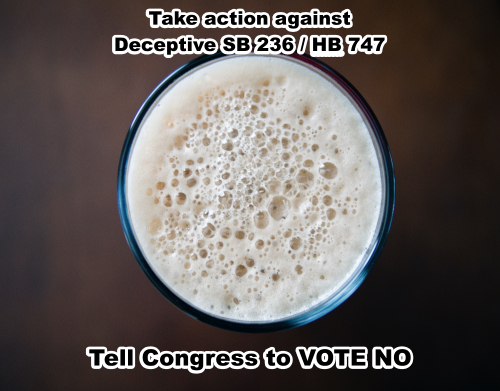 Tell Congress to VOTE NO on SB 236 / HB 747 – lowering alcohol taxes will do nothing but increase the costly harms of alcohol consumption.